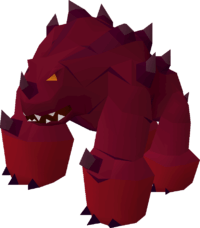 The TzHaar Fight Caves is an Old School Runescape challenge in which you must battle through 62 waves of monsters and then defeat the Fight Cave’s final boss – TzTok-Jad. Completing the fight caves awards one of the best melee capes in the game, the Fire Cape. On release, the Fight Caves was for a very long time the most difficult challenge in Runescape. As time went on, new gear and more advanced tactics decreased the difficulty of the caves to the point that some veteran players can now complete the Fight Caves in under an hour using very few supplies, with powerful weapons like the Twisted Bow. The most common tactic for completion of the Fight Caves is to use Ranged. Generally, players with 75 Ranged and above should be able to complete the Fight Caves with a bit of practice and a Toxic Blowpipe. This is a good challenge for new players who are looking to try out PVM in Old School Runescape. At least 43 Prayer is highly recommended for all methods of completing the Fight Caves, as the full set of Protection prayers will be needed throughout. Due to the variation in monsters throughout the 62 waves, you will at times need to use all different types of prayers and tactics to navigate through each wave efficiently and effectively. The final wave – Wave 63 – will see you put up against TzTok-Jad, a giant level 702 behemoth capable of killing you with a single hit. The trick to killing Jad is to identify which attack is being thrown your way and use the correct protection prayer to prevent it. Jad’s attacks are easily identifiable both by the animation and the sound that they make. If you can identify the attack and activate the correct protection prayer quickly, Jad’s attack will always hit 0. Once you’ve learned how to identify and pray against the specific attacks, the next step is dealing with the level 108 healers. These healers should be lured away from Jad one at a time and killed individually. Doing this whilst also praying correctly against Jad’s attacks is where a lot of players will die in the Fight Caves. Refer to the attached Video Guide by Seerz for an in-depth explanation of each wave in the Fight Caves and the final boss – TzTok-Jad. If you’re worried about needing more food to heal yourself in between waves, you can take a stack of Purple Sweets. Blowpipe should be used on everything except for the rangers. For speed you should use the following dart priority based on what you can afford. Dragon Darts > Rune Darts > Adamant Darts. If using a Crossbow, you may want to bring a Toxic Blowpipe to use it’s special attack for healing. As a 1 Defence Pure, you will take more damage than other players in the Fight Caves and a stack of Purple Sweets will come in very handy (although expensive).